Holiday is a 1938 film directed by George Cukor, a remake of the 1930 film of the same name. The film is a romantic comedy that tells of a man who has risen from humble beginnings only to be torn between his free-thinking lifestyle and the tradition of his wealthy fiancée's family. The movie was adapted by Donald Ogden Stewart and Sidney Buchman from the play by Philip Barry and stars Katharine Hepburn and Cary Grant and features Doris Nolan, Lew Ayres, and Edward Everett Horton, who played the same role he had played in the 1930 version. Although Hepburn had been Hope Williams' understudy in the original production of the play on Broadway, she only played the part for one performance. Screenwriter Donald Ogden Stewart had also appeared in the original stage version as Nick Potter. Johnny Case (Cary Grant), a self-made man who has worked all of his life, is about to marry Julia Seton (Doris Nolan), whom he met while on holiday in Lake Placid, New York. He knows very little about his bride-to-be, and is flabbergasted to learn that she is from an extremely wealthy family, the daughter of banker Edward Seton (Henry Kolker). He meets Julia's vivacious sister Linda (Katharine Hepburn), to whom he confides his plan to take a long holiday from work to find the meaning of life, and also meets the sisters' dissolute brother Ned (Lew Ayres), whose spirit has been broken by subservience to their father. At first, the father is stunned when Julia tells him about her plan to marry Johnny, but he is appeased after meeting him and looking into his work history. Julia makes plans for an elaborate New Year's Eve engagement party, even though she promised Linda that Linda could throw Johnny and Julia a smaller, more personal affair that would include only close friends. On the night of the party, upset that she did not get to throw the engagement party she was promised, Linda refuses to come down from her favorite room in the house, and Julia sends Johnny to get her. He finds her and Ned in the "playroom" – the one truly human room in the enormous, cold, over-built Park Avenue mansion – with Johnny's off-beat friends, Professor Nick Potter and his wife Susan (Edward Everett Horton and Jean Dixon), who have gotten lost and serendipitously ended up there. The group spends a joyful time together, interrupted – just as Johnny and Linda display a tumbling trick together – by Julia and her father. Mr. Seton offers Johnny a job at his bank, and Johnny reveals his plans for a holiday from work. Julia is appalled, as is her domineering father, and, after seeing in the New Year with Linda, and the announcement of the engagement to the assembled guests, Johnny leaves the mansion in a dark mood without saying goodbye to the family, but wishing the kitchen staff a Happy New Year. Linda tells her brother that she has fallen in love with Johnny, but because of her love for her sister she will keep her feelings to herself. Hoping to patch things up between Johnny and Julia, Linda goes to see the Potters and finds them packing their trunks for a voyage to Europe. She learns from them that Johnny is planning to go as well and has asked Julia to go with them. A telegram arrives, informing them that Julia has turned him down. Linda returns home, hoping to change her sister's mind, but they argue instead. Julia is certain that Johnny will give up his plans and return to her. Just then Johnny arrives with a compromise: he will work at the bank for two years but will quit then if he is unhappy. Mr. Seton accepts this, and Julia and he begin planning the couple's honeymoon in minute detail, mixing together stops at the homes of relatives with business-related matters. This makes Johnny realize that it just won't work, that marrying Julia on these terms will be more of an encumbrance on his freedom than he can abide, and he leaves to meet the Potters to sail to Europe. Linda sees from Julia's reaction that she is relieved by Johnny's decision, and makes Julia admit that she does not really love him after all. With the way now clear, and inspired by Johnny, Linda renounces her father's stifling influence and declares her independence, rushing off to meet Johnny and the Potters to go on holiday. Meanwhile, the Potters arrive at the ship, sad that Johnny went to take the job at the bank. He surprises them, and explains that he couldn't go through with it. They celebrate together, all very cheerful. Johnny is doing a back flip in the ship's hallway when Linda arrives. He sees her while he is mid flip and falls on his stomach rather than finishing as usual. She greets the three of them. Johnny takes her hand and pulls her down to the floor, and they kiss. In 1936, Columbia Pictures purchased a group of scripts, including the script for Holiday, from RKO for $80,000. Although the film was originally intended to reunite The Awful Truth co-stars Cary Grant and Irene Dunne, George Cukor decided to cast Hepburn instead, and Columbia borrowed her from RKO, where she had just turned down the lead role in Mother Carey's Chickens. Joan Bennett and Ginger Rogers were also initially considered to play Hepburn's role, and Rita Hayworth was tested for the role of Julia. The character of Linda Seton, played by Hepburn, was loosely based on socialite Gertrude Sanford Legendre. Jean Dixon retired from films after this performance. The working titles for the film were "Unconventional Linda" and "Vacation Bound". A scene that was to come before what is now the first scene of the film was set in the snows of Lake Placid, New York, although it was actually filmed in Bishop, California. The idea was to "open up" the stage play by utilizing an exterior scene, but when director George Cukor saw the scene, he did not like it and decided to cut it. A few still photographs, one of them on a lobby card that was distributed to theaters, are the only known remnants of this scene. Although the film was not a financial success, it was well received by critics. Hepburn biographers have speculated that Johnny Case's plans to give up working did not appeal to Great Depression audiences who were struggling to find jobs. Hepburn, at the time, had earned a reputation as box office poison, causing her departure from RKO Pictures. Holiday was the third of four films starring Grant and Hepburn, the others being Sylvia Scarlett (1935), Bringing Up Baby (1938), and The Philadelphia Story (1940). All but Sylvia Scarlett belong to a subgenre of screwball comedy called the comedy of remarriage described by the philosopher Stanley Cavell as Hollywood's crowning achievement. A recent reviewer referred to Holiday as "one of Cukor's best films". The film was nominated for the Academy Award for Best Art Direction by Stephen Goosson and Lionel Banks. 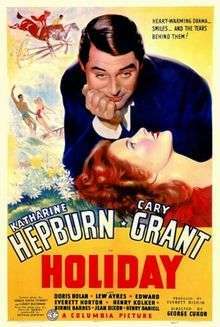 Holiday was presented on radio on the Screen Guild Theater program on November 13, 1944. ↑ Nemy, Enid. "Gertrude Sanford Legendre, 97, Socialite Turned Hunter and Prisoner of War". New York Times. March 13, 2000. ↑ Holiday DVD, "Deleted Scenes" featurette. Sony. 2006. ↑ "Holiday". New York Times. Retrieved 10 December 2008.